H. Rand GmbH | What is GRIP FIX™? Our palletizing safety systems are based on GRIP FIX™ palletizing adhesives. GRIP FIX™ anti-slip agents are water-soluble, solvent-free adhesives for securing pallet loads. The pallet loads may be PE bags, paper bags, cartons, cellophane-packed items, PP woven bags or small packages. How does GRIP FIX™ work? 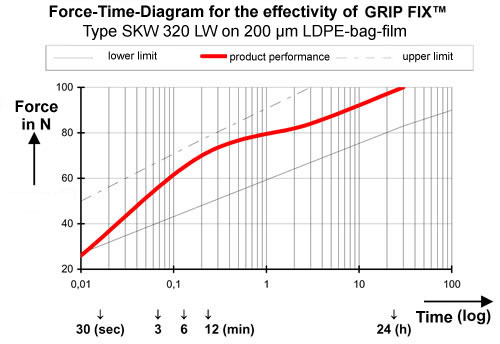 GRIP FIX™ is applied in small quantities to the pallet loads before they are palletized. After minimal drying time, the pallets become stable and remain so until they are unloaded again. What is the secret to all of this? High shear strength and very low peeling strength. The pallet loads do not slip, and the packages can be easily separated. In general, GRIP FIX™ leaves no residue after depalletizing. How to use GRIP FIX™? Using GRIP FIX™ is straightforward owing to our quick-connector system. Regardless of whether our palletizing adhesive is supplied from a canister or a drum, the container can be connected very easily to the system with the quick-connector. This produces a closed system where no dirt can enter the container, and the anti-slip agent remains uncontaminated and does not dry out. In addition, refilling is unnecessary. One other advantage depending on your requirements: we supply our GRIP FIX™ in a range of container sizes, from 1 kg hand-held bottles through to 1,000 kg containers.